- the Ceremony Room, recently refurbished in a modern style. Last but not least the possibility of holding your wedding any day of the weekand at various times. There is an increase of 20% for Saturday's celebrations and a 50% for Sunday's and public holidays celebrations. *All the prices are only indicative, you will need to contact the castle to get detailed prices. Click on picture to see the gallery. Fortified since the 14th Century by the stone towers of a Scaligeri Castle, this charming town combines its ancient charms with a wealth of onderfully scenic walking possibilities amongst olive groves and lush pine woods. Gathered around the picturesque harbor are the traditional pastel-colored houses and waterside cafés, which look out over the gently rocking boats and across to the resorts of Gardone and Limone. The spectacular cable car from the village takes you to the top of Lake Garda’s highest mountain, Monte Baldo, from where the stunning views will take your breath away Near Malcesine's harbour is the "Palazzo dei Capitani" from the Venetian period. 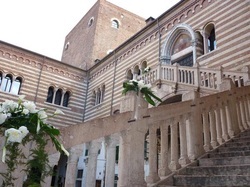 Malcesine is also a sailing and windsurfing paradise due to his position and the winds from the zone Here we have two different wedding hall inside the Palazzo dei Capitani overlooking directly the lake or the “Castello Scaligero” in which can be organized the wedding of your dreams. preparation, cleaning or services made by the staff of the Town Hall). If requested to celebrate the civil ceremony outside, on the terrace (Revellino) it will be imposed 20% of the above-mentioned sums. The ceremony can be tailored to individual or organise according to you including live music or DJ (CD- player available), readings or other events in order to create an unique and unforgettable moment for the spouses and their guests. 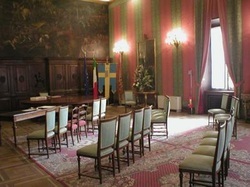 The room or the place where it will be hold the ceremony can be decorated with flowers or other decorations (white ribbons for example), informing in advance the staff of the wedding Office of the Town Hall. Repeating Romeo’s and Juliet’s vows of eternal love. 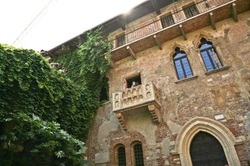 The legend of this house and its famous balcony arose from the first dialog in Shakespeare’s “Romeo and Juliet”, one of the most performed scenes in the history of theatre. It was in this very house that the eternal lovers professed undying love to one another. In fact, popular lore identifies the Shakespearean Capulets as the Del Cappelos, the noble family that owned this building for a very long time (from the thirteenth century) and whose coat of arms is carved over the arch inside the courtyard. Over the centuries, this house has become one of Verona’s most representative sites and is the destination of hundreds of visitors who arrive each day from around the world in a desire to pay tribute to love. The Medieval residence, picturesquely restored by Antonio Avena in the early twentieth century, features a beautiful internal facade made of exposed brick, a Gothic portal, trefoil windows, a balustrade that connects the various sections of the house from the exterior and, of course, the famous balcony. The interior contains furnishings from the sixteenth and seventeenth centuries, frescoes relating to Romeo and Juliet episodes, and Veronese Renaissance ceramics. The rooms on the upper level have a wood trefoil ceiling, with coffers that are painted blue and feature gilt stars. The bronze statue of Juliet by Nereo Costantini is displayed in the courtyard. The Notary's Chapel is the most prestigious room in the “Palazzo della Ragione”, the old City Town Hall. The majestic Palazzo is located in the southeast corner of the ancient Roman Forum between Piazza Erbe and Piazza dei Signori and was erected in the last years of the 12th century to host the Offices of the Magistrate’s Court. Throughout the centuries it became an important political center and housed in its big rooms the Notary’s College, the Silk Customs Offices, the Tax Offices, the Savings Bank and the Law Court. Built between 1408 and 1419 on behalf of the honourable Notary’s College that dedicated it to St. Zeno and St. Daniel, the Notary's Chapel is located on the first floor of the Masseria Tower (the fortified tower) and hosts one of the most valuable decorations realized on public commission. Giambattista Bellotti, Santo Prunati and by the French artist Louis Dorigny at the end of the 17th century. In the heart of Verona, where the history of the city unfolded. 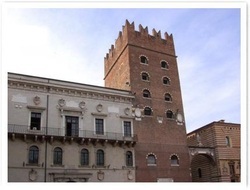 The large frescoed hall in the Torre del Capitanio was originally meant for entertaining. The first pictorial layer of the frescoes dates to the International Gothic Period. Between 1509 and 1517 Maximilian Hapsburg had a new decoration painted, exalting the nuptial allegory of the king and the City of Verona. The final pictorial layer celebrates the power of Venice, its victories in the Orient and its recapture of the city. (also known as Palazzo di Cansignorio), a thirteenth century residence once owned by the Della Scala family and rebuilt by Cansignorio during the second half of the fourteenth century. It is likely that this tower was once part of an architectural complex that was used as a residence from 1277 by Alberto I della Scala, who became Lord of Verona; it is the only surviving tower of the complex’s original four. The palace features the massive Della Scala tower, a beautiful portal by Michele Sanmicheli, and a fifteenth-century central courtyard that is enclosed by a loggia with three vertical sections and a portico; the seventeenth-century Bombardieri door is also noteworthy. The structure (created from a group of buildings dating from different eras and having various purposes, traces of which are still evident) was renovated at the end of the 1800s to accommodate the court offices. The Sala Arazzi (Tapestry Room), located on the main floor of Palazzo Barbieri, takes its name from the precious objects that were moved there after World War II and features two enormous tapestries dating from the late sixteenth century. The first tapestry, on the long wall opposite the window, depicts the Feast in the House of Levi. This work was produced by Veronese’s studio and is attributed to Benedetto and Carletto Caliari. The second tapestry, displayed on the smaller wall, is the work of Paolo Farinati and depicts the Victory of the Veronese over the Troops of Frederick I.
Palazzo Barbieri (also known as the Gran Guardia Nuova or the City Hall), was built during the first half of the 1800s by the engineer Giuseppe Barbieri as the headquarters for the Austrian Civil Guard. This large Neoclassical building was inspired by ancient Roman temples (as evidenced by the Corinthian colonnade and pronaos, as well as the large triangular pediment). Inside, two large tapestries by Paolo Farinati and Felice Brusasorci illustrate important events in the history of Verona. The building has been the City Hall since 1869.